Dyson V7 vs. V10 - Is the new Cyclone V10 Worth $700? This review is going to focus on the similarities and differences between the Dyson’s V7 vs V10. Both of these are part of Dyson’s top performing V-series and we’re going to put them to the test to see who performs better. Continue reading below to find out the results! The design differences between the Dyson V7 and Dyson V10 are not major. For the most part, these two Dyson vacuums share extremely similar design components. AESTHETIC | Each of these V-series units utilizes a specific color scheme that helps users differentiate between the two models. This is a common characteristic among all of the Dyson V-series vacuums. TRIGGER | A trigger is used by the V7 and V10 in order to apply power to the motor. Squeezing the trigger applies the power and once it is released, the motor shuts off. Therefore, battery is only being used when the trigger is being pulled. 2-IN-1 DESIGN | One of the most notable design features about both the V7 and V10 is the ability to remove the wand and use the unit as a handheld vacuum. Most of the tools included with each of these vacuums can be inserted into the main handheld portion of the V7 and V10, or users can insert these tools into the end of the wand. This creates a much longer reach and certainly adds to the versatility of the vacuums overall. MOTOR | Now, the main differences between these two Dyson’s is the radial cyclone layout and the size of the dust bin. The cyclones on the V10 have changed to be more in-line with the dust bin, allowing for more power and a better balance of weight. The V7 cyclones sit in the middle of the vacuum and contain more of a vertical angle. DUST BIN | The dust bin on the V10 is almost 50% larger than the V7. Unlike the V7, the V10 stretches the entirety of the handheld portion of the unit. This design change allows for more dirt / debris storage. RELATED – For more information other Dyson see our our complete Dyson vacuum reviews guide. Both the Dyson V7 and V10 utilize an advanced digital motor, each spinning well over 100,000 RPMs. More RPMs (revolutions per minute) result in greater suction power and improved cleaning performance. CYCLONE DESIGN | Dyson integrated their patented cyclone design into both the V7 and V10. That said, they are quite different when it comes to how they implemented these on each unit. Each one uses the 15 cyclone system, but on the V7, the cyclones sit perpendicular to the dust bin, as compared to the parallel integration of the V10’s cyclones. In my opinion, the new cyclone layout on the V10 creates a much sleeker look, but Dyson also notes it helps improve suction power as a whole. CLEANING HEADS | The cleaning heads are another area where the V7 and V10 differ. The Dyson V7 comes with Dyson’s direct-drive head as well as the soft roller head, depending on the model you choose to go with (4 available on Dyson.com). We tested the V7 Motorhead, which only includes the direct-drive cleaning head. Similarly, the Dyson V10 includes different cleaning heads depending on the model you choose. We tested the Dyson Cyclone V10 Absolute, which includes two cleaning heads; Dyson’s soft roller head and their new torque-driven head. Soft roller head – The soft roller head is designed to be used on hard floor types and is able to handle larger debris. Torque-driven head – This new torque-driven head is ideal for carpets, but can be safely used on any indoor floor type. Either of these heads can be attached to the wand with Dyson’s quick-release system. 2-IN-1 DESIGN | The V7 and V10 can be operated in two different configurations, handheld or stick vacuum. To use each as a handheld simply attach cleaning tools to the main unit. On the contrary, to use them as stick vacuums, snap the wand into the main unit and attach a cleaning head to the bottom of the wand. 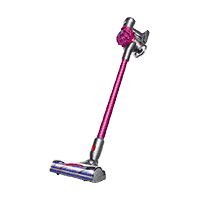 Both the Dyson V7 and V10 can be configured to be used as a handheld vacuum. The size differences between the V7 and V10 are not significant, but they could have a slight effect on the overall maneuverability and usability of the vacuum. The Dyson V7 is 49″ tall, 9.8″ wide, 8.2″ deep, while weighing 5.45 pounds. The Dyson V10 is slightly larger at 49.2 tall, 9.8″ wide, 10.1 deep, and weighs 5.8 pounds. RELATED – Need a tiny vacuum for your home or car? Check out this list of the best small vacuums. The Dyson V7 and Dyson V10 have not had too many differences up to this point, but will that change with accessories and parts? Based off of everything we have seen, the accessories and parts available with the V7 are almost identical to the V10, depending on the model you choose. Blue checks indicate accessories that come with all models, red x’s indicate accessories that don’t ever come with that that series, and the question marks indicate that it may or may not come with that accessory (depending on the specific model, see more below). Direct Drive cleaning head: This head is offered by the V7, but not the V10 (the Torque Drive replaced it on the V10). As the primary brushroll for the V7, it is used to agitate dirt and debris in carpeted surface. However, it’s also safe for hardwood floors. Torque drive cleaning head: The torque driven head completes the same job as the direct drive head, but is an advancement over the direct drive head. The torque drive head is notably larger than the direct drive cleaning head. Soft roller head: This head is best suited for hard floor surface types and can be used to pick up larger debris. Aside from the cleaning heads, the V7 and V10 have the same parts and accessories available, but the models we are comparing have a slightly different lineup. See the table below, which indicates which parts and accessories are included on the most popular Dyson V7 and Dyson V10 models. Charger: Plugs directly into the wall and the base of the unit to charge before use. Wall mount: Allows users to hang their Dyson while it charges. Combination tool (quick release): This tool acts as both a dusting brush with medium bristles and an upholstery tool. Crevice tool (quick release): Long, slim tool that allows users to reach into corners hard-to-reach spots. Wand: Used to create the stick vacuum or add length to the end of the handheld vacuum. Dusting brush (quick release): Soft bristles used to dust more delicate surfaces around your home. Mini-motorized brushroll (quick release): Motorized brush helping to agitate dirt and pet hair from upholstery. If you do decide to purchase either of these vacuums from Dyson.com, you have the opportunity to add three additional cleaning tools if you auto-register your warranty. There is a plethora of tools to choose from (mattress tool, carrying bag, larger dusting tool, etc. ), but the tools available are the same for each unit. We perform a total of 12 debris tests, using 3 different flooring types and 4 types of debris. We test on engineered hardwoods, low pile carpet, and high pile carpet. Overall cleaning performance on the Dyson V7 was strong, but the vacuum did struggle a bit on hardwood floors. The Dyson V10 only managed 66% for rice on hardwood floors and was unable to remove any of the cereal. Since we had the Dyson V7 Motorhead, we did not have the fluffy soft roller brush for hardwoods. This undoubtedly would have yielded better results for the V7. Nevertheless, the direct drive cleaning head wasn’t great at removing rice, as it had a tendency to toss it around. Cereal was a less complex issue, as the size of the direct drive cleaning head was simply too close to the ground to get over the top of the larger cereal debris and remove them. That said, Dyson V7 cleaning performance on low and high pile carpet was virtually flawless. See our Dyson V7 review for our comprehensive cleaning test data, as well as all of our before and after photographs. The Dyson V10 was nearly flawless across all of our cleaning tests. The fluffy head performed exceptionally on hardwoods and the torque drive was virtually flawless on both our low and high pile carpet tests. See our Dyson V10 review for our comprehensive cleaning test data, as well as all of our before and after photographs. RELATED – Want to see more top performers? Check out our best vacuum cleaners guide, including our sub-guides for thebest vacuums on hardwoods and on carpets. Using the Dyson V7 and Dyson V10 is similar in many ways. There are some slight differences, but the main functionality of the vacuums are the same. UNBOXING | Each of these vacuums arrive almost fully assembled, with a few extra parts that could be added to the vacuum to change its cleaning style. Once everything has been removed from the packaging, the only assembly required is snapping in the “quick release” tool that you wish to use. This quick release mechanism was implemented into all of the V-series vacuums after the Dyson V6. Simply snap the tool into place and push the red button to release it from the unit. SETUP | Setting up the V7 and V10 is even easier than using them. Unbox the unit, charge it, and you’re good to go. DAILY USE | Using the V7 or V10 on a daily basis is virtually identical. The trigger located on each vacuum’s handle is the power source. Pull the trigger to apply power to the motor and release it to cut the power off immediately. Battery life is saved through this style of power mechanism because the battery is only being used when the trigger is being pulled. EMPTYING THE DUST BIN | The dust bin is the biggest difference when it comes to using these two Dyson vacuums. Much like the Dyson V8, the V7 has a latch on top of the unit that can be pulled up to release the dust bin. On the other hand, the Dyson V10 utilizes a new design with regard to where the latch is and how it releases. Dyson is calling this their new “point and shoot” dust bin release. The red latch is located on the underside of the dust bin along the front end of the handle. Users have to push this latch forward, with a decent amount of force, and the dust bin will release, allowing users to “shoot” the dirt and debris into the trash can. Maneuvering the Dyson V7 is no different than the Dyson V10. These units both have the ability to take sharp corners, squeeze into tight spots, and get into those more difficult to reach spots. Maintenance costs and tasks on the both the Dyson V7 and Dyson V10 are quite reasonable. Both the V7 and V10 use a lifetime washable HEPA filter (note: some models don’t use a HEPA filter). In addition, the V7 uses a lifetime washable central filter. To maintain these, simply remove and wash with cold water once per month and allow to air dry for 24 hours. Beyond that, the only other maintaining task is to empty the dust bin. The Dyson V7 will cost you around $17 / year for annual maintenance. Compared to the Dyson V10, which will cost you $0 / year for annual maintenance. The biggest difference is simply the battery. The Dyson V7 uses an older generation battery that will likely need to be replaced every 2’ish years, depending on use. The Dyson V10 uses an advanced battery that will, according to James Dyson (Dyson’s founder), last for 15 years. This effectively allows the battery to last for the lifetime of the unit, dramatically reducing annual maintenance costs and costs over your life of ownership. As we look at the batteries offered by these two vacuums, the Dyson V10 certainly offers a higher quality. The V10 is run by a seven-cell, lithium-ion battery that has the ability to power the vacuum for up to 60 minutes. The V7 also uses a lithium-ion battery, but the run time is closer 40 minutes. That said, both of these vacuums offer a “Max” mode, which reduces the battery run time down to 6-7 minutes. With regard to noise, the Dyson V7 is a touch quieter than the V10. The V7 measures at about 70 dB from 3′ feet away, whereas the V10 hit 75 dB. RELATED – If you’re looking for a vacuum that’s quieter check out our robot vacuum reviews, including the Roomba 890, Roomba 690, Ecovacs Deebot N79, and Eufy Robovac 11, all of which are between 56-68 decibels. All things considered, the value of the Dyson V7 is quite good. That said, there are areas for improvement. The cleaning tests on hardwood floors were a bit of a shock, as the cereal and rice caused problems for the vacuum. Yet, the low and high pile carpet tests were nearly perfect. As we move onto the design of the V7, most everything is the same when compared to the V10. The big changes to note are the dust bin and the new cleaning head. The dust bin on the V7 is easier to empty in my opinion, but from a hygienic standpoint, the V10 has the upper hand. Not to mention, the price of the V7 is dramatically lower than the V10. If you’re okay with a bit of a drop in performance, but still want a high quality stick vacuum, the Dyson V7 is a great option. Returns – 30 days via Dyson.com. May vary from other retailers. Although the price of the V10 is a good chunk higher than the V7, I do believe the value of this vacuum is still strong overall. The sheer cleaning performance, battery run time, variety of tools included, and design improvements make this stick vacuum one of the best we have tested to date. It is not the best valued vacuum, due to the price, but I would say the value of the V10 has a slight edge over the V7. Returns – 90 days via Dyson.com. May vary from other retailers. RELATED – Looking for something less expensive? Check out our guide on the best cheap vacuums. Weight 5.45 lbs. 5.8 lbs. According to Dyson, the V10 has improved suction power by 40% as compared to the Dyson V7. The newly redesigned cyclones help created a more streamlined airflow, leading to more powerful suction. The Dyson V10 has a run time of up to 60 minutes, compared to the 30 minute run time offered by the V7. The Dyson V7 is a few years old, but still a strong performer. The motor and battery that drive the unit are both solid, resulting in strong cleaning performance overall (provided you purchase the model that’s best suited to your home’s surfaces). You want a lower price – the Dyson V7 Absolute is cheaper than the V10 Absolute. This is a pretty sizable chunk of change in savings. You clean in shorter bursts – The V7’s battery lasts for approximately 30 minutes of run time, this compared to the V10, which can go an hour. A longer battery is great, but if you rarely use it then there isn’t as much point in paying for it. Additionally, the smaller dust bin of the V7 is less of an issue if you clean in smaller burst sessions. For more information on the Dyson V7 click here. The Dyson V10 is Dyson’s newest model and is the one of the best performing vacuum cleaners we’ve tested to date. In terms of raw cleaning and features it simply offers more than the V7 in every area (but at a cost). You want the best cleaning performance – if you’re looking for the best overall cleaning performance there is no question, the Dyson V10 is simply better. You want lower maintenance costs – one of the biggest differences is Dyson’s new battery, which according to Dyson’s founder will last for 15 years. This means you may never need to replace the battery, which could save around $150-$200 over a 10 year period (comparing the cost of the Dyson V7’s replacement batteries). You want bleeding edge features – a 60 minute run-time battery that lasts 15 years, a sizable 0.77 liter dust bin, the strongest suction Dyson has put in a stick vacuum to date, and a ton of accessories, the Dyson V10 has a lot to offer. You want the better value – while the V10 is more expensive, the combination of improved performance and ultra-long battery life make this unit a better overall value, in our opinion. For more information on the Dyson V10 click here.